Insurance Quotes from 100+ Insurance Companies allows SGB’s Insurance Broker Agents to offer you the lowest insurance premium rates on Business Insurance, Commercial Insurance, Auto Car or Commercial Vehicle Insurance, Home & Auto Insurance, Health and Life Insurance coverage with policies customized to meet your specific protection needs. SGB Insurance can provide you with insurance coverage for almost any asset you want to protect. Our Quote Request Forms have only 4 to 5 Required Fields, then Click Send You’re Done. We are Insurance Brokers NOT Lead Brokers who sell your contact info to the highest bidder. Unknowingly complete a Lead Broker’s form, you’ll get calls from 10 to 20 desperate agents for months. For Business, Commercial or Personal Insurance Coverage. When You Need More, We Can Cover More For Less! Insurance does not have to be complicated or unaffordable. Our intention is to provide you with the simplest means of issuing your policy while providing the coverage you need at the lowest available rates. We do this by doing your comprehensive needs analysis. We’ve carefully chosen a select group of financially sound, A.M. BEST B+ to A++ Rated insurance providers and work closely with their Brokers enabling us to cover many additional Insurance types possible to meet your specific insurance needs. NO HIGH-PRESSURE SALES PITCH FOR EXTRAS YOU DON’T NEED! In his Prep Talk, Sean Kevelighan discusses the essential part that insurance performs in individuals’ lives and communities, both prior to and subsequent to a disaster. “What takes place when the water drains, when the dust settles? View this online video to see the full video presentation hosted by FEMA and head to www.iii.org to find out more relating to the insurance industry. We’re here to help answer your questions. We understand Insurance matters can be complicated. Our experts are on hand to help inform you of every aspect regarding your issue. Unlike Captive Agents who only work for insurance companies like Farmers, State Farm or All State; Our Independent Agents do NOT work for ANY insurance company. Our Independent Agents will work for you, with 100+ insurance companies to get you the best coverage for what you need at the best rates available. We have partnered with over 100 Insurance Carriers enabling us to provide you with exactly the coverage you need at the lowest rates available. Working with 100+ insurance companies not only gives us the largest portfolio of insurance carriers in the region but gives us the diversity to offer coverage on anything you could need to be insured. “I don’t know why I thought I should be so guarded about talking with Commercial Insurance Broker Agents about the kind of coverage I needed for my Home Based Business. SGB didn’t make me feel like my business is “Small potatoes” or not worth their efforts. They treated me like the CEO of a big company. And I got only the coverage I need for now, at a fair rate.”_Barb S.
We work as a single united team with over 100 of the best-rated insurance carriers to offer our clients only the coverage they need at the best rates available. Shopping Auto Insurance for Murrieta, Temecula or Menifee CA Residents? Purchasing auto insurance is certainly not a stroll in the park if you want the best coverage for your situation. And regardless of what the commercials say on TV claiming that you can find quotes with one click of the mouse if you want to end up with the right kind of insurance coverage for your particular situation, you really have to do some careful shopping to find the best rates. Sure you can go to an on online quote site, take 5 to 10 minutes to fill out all the information, then click the “Get My Quote” button and get prices from several different companies. Then go to another Car Insurance Quote website and get another set of prices from another set of companies. Rinse and Repeat, Rinse and Repeat! Do you really have time for that nonsense? Run of the Mill One Size Fits All Online Insurance Quotes? Really? About all you can determine with online insurance quotes is a general idea of an approximate cost for a policy that may or may not fit your specific driving situation. Finding the right insurance coverage, with the right company at the right price can be challenging. What makes it so challenging is that there is no “Standard” that gives a list of rates based on just a few variables. The list of factors involved that affect rates for car insurance coverage is pretty long. As well, with so many companies offering all types of auto insurance, the field can be competitive. The downside is; all of those companies each have different criteria for calculating rates established on a case by case basis. So it can get confusing when shopping Auto Insurance online. Is it any wonder that people have a hard time figuring out how or where to buy car insurance. If you are in the market for auto coverage, below are just some things each company will consider to establish your rate based on a risk basis that differs from company to company. You Can Spend Days Getting Insurance Quotes from Machines only to End Up More CONFUSED! Factors to be considered: Vehicle, year, make & model, auto safety equipment and safety rating, geography, distance to work, average miles driven annually, driving record, number and type of accident claims, years of driving experience, education, credit rating, age, gender, if you are currently covered, type of coverage (Full or just liability), and the list goes on … If you have the time to compare all these factors and their variable prices online to determine which is the best quote for you and just love doing hours of online research, you’re a rare breed indeed. Option 1: Call around to all the captive agents that write policies for only one carrier like Allstate, State Farm or Farmers etc… until you find one you like and hope their company is giving you the best deal. Option 2: Save yourself the time and hassle – Have an insurance professional shop 100+ of the best insurance companies in the country, based on your needs; then present you with the best rate quotes and explain each so you can make an informed buying decision. So If You’re Shopping for Auto Insurance Murrieta, Temecula or Menifee CA? Let SGB do the Shopping for You! That is where SGB Insurance Services, Inc. comes in. As an independent broker representing over 50 of the top carriers in the country, we take our time and do all the shopping for you. We take the time-consuming hassle and mystery out of shopping for vehicle coverage for you. Check out our Professional Auto Insurance Murrieta Shopping Services. 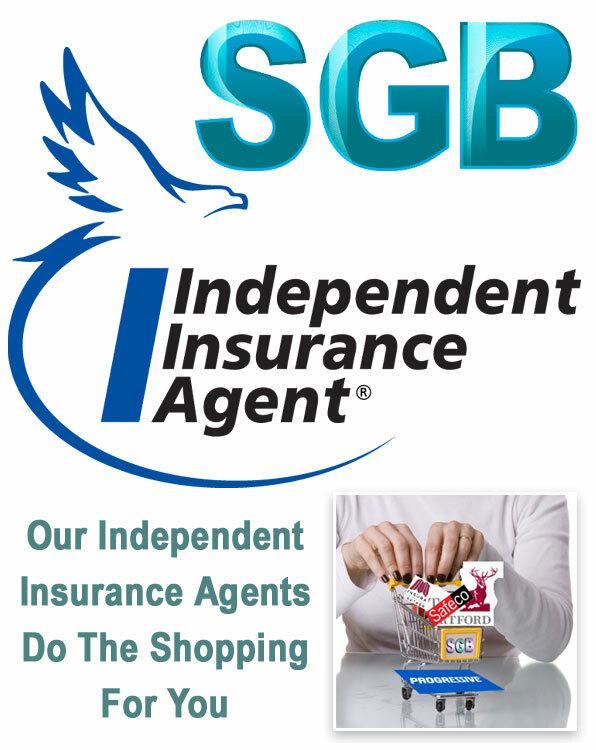 Let one of our Independent Auto Insurance Agents do the shopping for you at SGB – CALL: (951) 363-2886 today.